As I have continued in my journey of learning how to get the best flavor out of food, time always seems to be a factor. The time between harvest and being on your table is one time factor. Try a fresh, “new crop” apple from your local produce stand next to a last season apple on clearance right now, and you will find that time effects taste and texture quite dramatically. When watching certain cooking shows, or reading most cook books, you will find many recipes that try to cover up the lack of time most home cooks have by using many store bought ingredients to give that “long simmered” taste in a short amount of time. Time is one of the biggest taste factors in our kitchen, and it is what so many of us feel we don’t have. We live hurried lives, and we often don’t even realize it because everyone lives their life just like us. What we put on our table reflects this lifestyle. As I have tried to go back more and more to food in it’s most homemade, nourishing state, I have found that at almost every step, doing it myself saves me money, and costs me time. Making your own pasta is no exception. It saves me quite a bit of money (compared to buying brown rice pasta), and it costs me a little work and time. The end result is a rustic pasta, soaked for better nutrition, that all of us enjoy. The same as white flour pasta? No. Delicious? We think so. My two year old eagerly looks forward to pasta days, and my husband always appreciates it too. Don’t expect the same culinary experience of eating durum pasta, but enjoy the hardiness of whole wheat and expect it to be more filling. I am so glad that I have found it possible to make a soaked pasta, because who wants to give up pasta? For a while, I thought that pasta could only be a compromise food, so I am very happy to find a nourishing solution to a favorite food. To read more about why I choose to soak my grains and flours read part one and part two of my posts on soaking grains. Many Italian families still make pasta every day. I figure I can manage once a week and I have for the most part. If I am especially tired, I do something easier. Italian families also make pasta together. It’s a community, family project that doesn’t isolate the cook in her/his kitchen. It’s a time of busy fingers and conversation and laughter. Elena is only two but already she is learning to enjoy making pasta with me. She sits in her little sit at the table and I give her a small piece of dough, which she tries to roll out as best as she can. I meanwhile roll out my piece and cut them out, handing her pieces to place on the cooling racks I use to dry them on. Cooking should be a family project whenever possible. Turn off that TV, and enjoy the simple pleasures of life, which in my book, include making homemade pasta. For a while I was rolling my dough as thin as possible. This produced a wonderful texture, but the pasta fell apart very easily. If you leave it thicker, you will find that it is a hardier pasta, but will stay together better. You decide how you want it. I should really call this “poor man’s pasta” because it doesn’t include any eggs. I also was able to make this with spelt flour, though it is a little harder to work with. In a large bowl, combine three cups of flour with the water and vinegar. Stir with a wooden spoon, until it becomes too stiff to stir. Dump out onto a floured surface, and knead for ten minutes, adding in more flour if needed, to create a stiff dough. Wash out your bowl and dry and drizzle a little olive oil in. Place you dough in the bowl, turning over so that the dough has olive oil on both sides. Cover well, and leave out on the counter over night. The next day, separate your dough into four balls. Roll out each piece of dough to about a 1/4 inch thickness (read note above), using flour on your surface and rolling pin, and cut into thin strips. I find a pizza cutter very helpful for this step. You can now leave to dry on a floured surface, or on cooling racks for several hours. Or you can cook immediately. To cook, bring a large pot of water to boil, and salt liberally. When the water is at a rolling boil, add your pasta, slowly to the pot. Boil for about 10-15 minutes, until the pasta is cooked and soft. I find that the texture of the pasta better when cooked longer. Serve with your favorite sauce. This post is part of Kitchen Tip Tuesday! Have you ever thought of drying your pasta and freezing it for future use. I’ve done this with success. You don’t have to make a bunch up ahead, but double your recipe and dry half. If you search around the internet you will find pasta drying racks for little to no money. Or just lay your pasta on a cooling rack so air can circulate around it. Thanks for this post. Been wanting to try this for awhile, but never saw a recipe that looked “do-able” for me. How much does this make, Kimi? We have 5 children, ranging in age from 6 to 16 and then my husband and I. Any suggestions on whether I’d need to double or triple this? That’s a great question. Thanks for the feedback. I have experimented with drying it, both on the cooling racks and laying on a floured surface (you just have to flip them). I find that the noodles I roll out thinner dry faster and cook better after being dried. The thicker ones don’t have as nice of a texture as when fresh. So I am still working on getting it dried like I like. I actually didn’t even need to freeze them, but just dried them until they were very dry and stored in an airtight container. Another option would be to freeze the noodles before they dried. This looks wonderful. I have some defect when it comes to rolling things flat, but I’m going to give it a try and see what happens. I might have lumpy noodles, but my guess is they’ll still be delicious. We’ve made our own pasta quite a few times…my best drying rack? Lay out a broom between the backs of two kitchen towels. Hang a clean dish towel or two over the wooden broom handle. Hang the pasta on the broom. Works great! For fun sometimes we’ve also used a super tiny cookie cutter to cut out shaped pasta – kids thing it’s fun! We love pasta, I just thought making it myself would be to much of a pain, I’ll have to give this a shot. Thanks for sharing! I have been looking for a recipe for soaked grain pasta for months! I could just kiss you! LOL! Thanks a bunch, I’ll be trying this soon! Just to clarify: you don’t roll this through a pasta machine? The only way I’ve made pasta is using my old-fashioned metal pasta crank, and of course I’ve never tried whole wheat flour. It’s a great idea! I like to hang my spaghetti on clean wire hangers to dry. And I LOVE to use a glass to cut circles and make raviolis! 1 pound of pasta (about what this recipe makes, I think), is supposed to make four main dish servings, or 8 first course servings. If you want to make it stretch a little more, serve with lots of garlic bread and a big salad! Yes, I do just roll it out with a rolling pin. But if you work with a machine, let me know if this recipe works with it! I am so excited to try different shapes and methods! It’s going to be fun to experiment. One thing that I forgot to mention in the post was that when soaking this recipe, sometimes the top will discolor. Don’t worry about it though, it doesn’t effect the taste and once you roll it out and cook it, it doesn’t effect the color either. I find myself wishing I could have these noodles, they look so lovely! You are truly talented at this food thing. 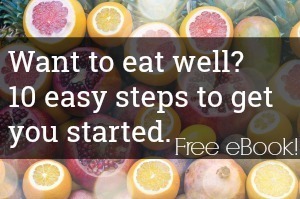 Your site always makes me hungry for good, clean, healthy food. I’ve been wanting to try making my own pasta for a while. This recipe makes me feel better about eating and serving it. Thanks! Thanks for the tip, I make my own pasta, but wasn’t sure how it would turn out if I soaked the grains, so I’ve never tried. I noticed you mentioned finding wheat berries…, I don’t have a grinder yet so does this work the same with just store bough organic flour? I’ve never worked with the extremely fresh grains, but I’m hoping to get a grinder in the near future so I can do this. Thanks! Thia blog is great, I am getting so many new ideas. I just tried the soaked noodles today, well I was going to make noodles. Then I thought I should try making ravioli. I was so good. I have never made pasta or ravioli before so I made it up as I went. I found a ravioli stuffing recipe (ricotta, spinach, mozzarella, and egg) online and toped it with marinara sauce just before eating….. It was too good!!! Thanks for the soaked pasta recipe! BTW, love to check your site for inspiration and recipes! I find that pasta is easy on the stomach, including this recipe, but that may just be a personal thing. 🙂 I think that this recipe of soaked whole wheat pasta seems more digestible then brown rice pasta or whole wheat pasta. It’s very nice to eat when you have a stomach flu. But there is a traditional way of making egg noodles using a high amount of whey. You can read about it here. I just tries these noddles with a homemade alfredo sauce it it was outstanding. I will definitly be trying this again. Thankyou for posting the recipe. This looks great. Is there anyway I can figure out the nutrition information for each serving? I just want to ask that if you make a dough out of flour and leave it overnight at room temperature, will it not ferment? My dough fermented. Is it expected? Thank you so much for posting this! I have been buying “compromise” pasta every once in a while and feeling guilty for it, but I’m so excited to try this for my family! okay, so this is going to sound like a dumb question but I am new to all this as my son was just diagnosed with ileocecal valve syndrome and where advised to start use soaked grains for easier digestion. He loves pasta so the recipe above looks fantastic, my question is – do you soak the whole wheat or spelt flour overnight first and then continue with the recipe or is the soaking included in the “Cover well, and leave out on the counter over night”? Any help would be appreciated. I’ve been MIA for a while, but my quest for a good pelmeni recipe brings me back to you. 🙂 I found a recipe that looks good at Nourished Kitchen (I think they’re using the WAP dough recipe). My concern is that I don’t have a reliable source of pastured eggs. How can I soak the dough for the required 2-3 days (or at least 24 hours!) safely, without the egg? Can I soak the flour, and then add the egg? It seems that it would be awfully difficult to incorporate the egg once the dough is formed. Love your site, I saw someone asked if pasta had always been bad and had our ancestors eaten poorly. Well in the olden days, wheat was gathered and then tied into bunches, during this time, the wheat would start to germinate because the time was so long, so it was like they were always eating sprouted wheat. I read that once and it made sense, I am a wheat farmer in Kansas and with tractors and combines we get the wheat to storage before it ever gets a chance to become wet and sprout. That was it, not sure of the truth but I believe it. When you don’t have the time or the energy have you considered making a whole wheat spaetzle? I just made spaetzle tonight when I needed a quick side for friends when my husband is not eating any carbs. I just mixed 1/4 c milk, 2 eggs, 1/2 tsp salt and a cup of flour. Mix well and boil in salted water or broth to which you have added a little oil. Use a large spoon to scoop up some dough and scrape small portions off into the broth. Let boil until they rise. Serve with butter or fry in some butter in which you have browned some minced onion. I would think you could make it using whole wheat definitely and if you want to soak the flour I would do it without the egg and add the eggs just before using. Since all pasta does not have eggs you could probably make it without them. Please note that I have not made the whole wheat version that I am suggesting. I probably would soak the wheat flour and then add the eggs and an equal amt of unbleached flour. Kamut will work it is high in protein and lower in gluten than durum wheat flower. Spelt will work too but not as well in my onion. Fresh ground will surprise you. Fresh ground home made pasta. Damn good and good for you. If you add a table spoon of fresh ground flax seed for however many eggs one would put in a recipe, you can make thinner pasta that hold up better. A great way to cut noodles (which I learned from my grandma) is to roll up the dough and slice, then unroll the spirals before boiling. Can’t wait to try your recipe! I just found this recipe and am excited to try it. I was just wondering if you let these completely dry, how long do you think you could store them before cooking? I store everything in airtight half gallon jars and was just picturing making a big batch of dry pasta to store for when we’re ready to use it. Thanks for the great info! spelt noodles are exactly what im looking for. how did you find it harder to work with please? in fact i am looking for wheat alternative pasta such as sesame flour so i am curious. a tip on freezing the pasta, my MIL makes egg noodles, she rolls her pasta on freezer paper, cuts it in long strips rolls the paper up and puts the rolled up noodles packages in a ziplock bag for later use then when she needs the they break as she unrolls the to use in rustic soups and such. Thank you so much for this recipe! I was wondering if this recipe would work with brown rice flour as well. Have you ever tried that? How would this turn out if I added an egg to it?